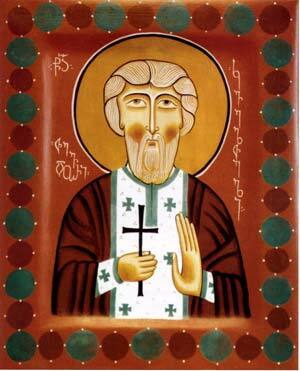 Saint Tevdore was a simple priest who labored in the 16th century in the village of Kvelta. At that time the Ottoman Empire and Persia were locked in a bitter feud over control of the Near East. At the beginning of 1609 the Ottomans conquered first the city of Baghdadi, then part of Samtskhe in southern Georgia. In June of that year they launched an attack on eastern Georgia. At that time the Georgian ruler was the young King Luarsab II. When the Ottomans penetrated Kartli, the king was absent, abiding in his summer residence, Tskhireti Castle. But the Ottomans knew the location of his castle, and they also knew that his troops were small in number. They plotted to lay siege to the castle, capture the king, and ultimately annex all of Georgia. St. Luarsab had received no warning of the attack, and the enemy was just minutes from his castle. In the village of Kvelta, not far fromManglisi, the Turks captured the priest Tevdore, a man sincere before God and devoted to his king and motherland. Fr. Tevdore was unable to escape to the woods with the other villagers, so he locked the doors to the church and concealed its sacred treasures. When the Ottoman Turks found Fr. Tevdore, they commanded him to lead them to Tskhireti Castle and threatened to kill him if he refused. Hoping to deceive them, Tevdore led the Ottomans along a narrow, rocky mountain path away from Tskhireti Castle. Many horses and soldiers fell from the path to their deaths. But after some time the Ottomans realized that the priest had led them in the wrong direction. Embittered and hungry for revenge, they beheaded Fr. Tevdore. As a result of St. Tevdore’s great sacrifice, St. Luarsab had time to strengthen his fortifications, assemble his armies, and finally annihilate the enemy.